I've had this statue for years. I have it outside by my pool and it has held up well over the years. It is lightweight so you do need to be careful with it. Seems like if something heavy was dropped on it, it would be destroyed. Here's a beautiful, serene Buddha statue that will find a welcome home in your house, garden, even your office. Nearly 20 inches high, and in the lotus pose we all know and love, this statue will bring a sense of peace. 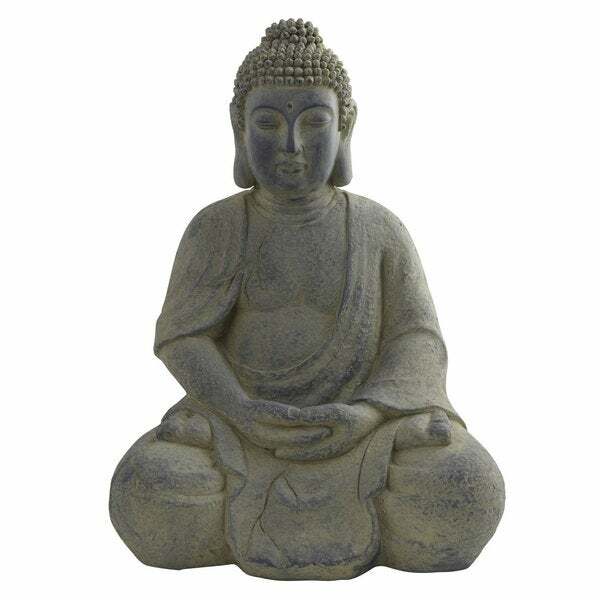 This calm and serene Buddha looks like rugged concrete but is actually very light weight. He is supposedly suitable for outdoors but I don't agree, for one thing he is much too small for outdoors and also I don't believe the material would stand up to the weather. That is just my personal opinion. Even so, he is beautiful and has found a home in a corner of my den where he radiates calm and contentment all day. I just love him. Love this Buddha statue! He looks great in our backyard garden. Great design, finish, quality and value, and the statue adds calm and serenity while we sit on our patio enjoying an evening sunset. I'm very happy with my Buddha Lotus Pose statue. It isn't too bulky or heavy and it sits proudly in my newly furnished living room! I love this piece. It sits in my garden illuminated my a small spot light. It has withstood weather and still looks great. I would recommend this Buddha statue! Perfect for our Zen outdoor garden. Nice grey finish. Bought this for a friend for her birthday. It was exactly as described, and is so pretty! It made her very happy, and is now living in her garden. Lovely details, nice size. Very happy with this purchase. Love this Buddha. It looks great in my garden in the summer and on my protected deck space in the winter. This looks so gorgeous in my garden, beautiful size, I'm so happy with it! It is well made and looks just like in the photo. Perfect as a picture! Beautiful piece! "How much does this statue weigh?" Hello lucym74, we appreciate your inquiry. The approximate shipping weight for this item is 12 lbs. We hope this information has been helpful. Thank you for shopping with us. Have a great day!